Join the Freedom Loan Fund Campaign! An amazing transformation is happening in Nepal, and you can be part of it. Girls who were rescued from the Kamlari system of child slavery are now free — and they’re becoming powerful young women who are starting their own businesses with help from a co-op loan program funded by Nepal Youth Foundation (NYF). It’s already a huge success. The freed Kamlaris have formed 37 business co-ops with 2,600 members. And they’ve already reinvested $40,000 back into their co-op loan fund. But here’s the problem: the loan fund can’t keep up with all of the former Kamlaris who want to start a business. There are hundreds of eager young women on the co-op loan waiting list. You can help! Join the Freedom Loan Fund Campaign and you’ll give hundreds of former child slaves in Nepal the opportunity to start a business and make a new life. Let’s show the freed Kamlaris in Nepal we stand with them! Mina, beauty salon owner After Mina was rescued from Kamlari, she entered our special program to make up the schooling she had missed. She graduated high school and went on to beautician training in vocational school. 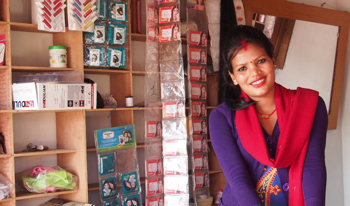 Mina opened her own salon with a co-op loan, and now offers haircuts, facials and more — and earns up to 1,000 rupees a day. And she’s still in college, working towards a health degree. Kamala, motorcycle repair shop She may be the only female motorcycle mechanic in Nepal! Kamala spent seven years as a Kamlari, working under terrible conditions. NYF rescued her in 2004 and put her through school and vocational training. 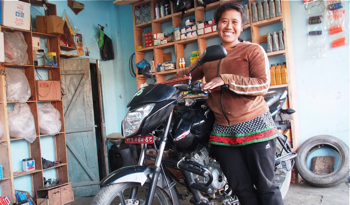 With a loan from the co-op, Kamala started her business fixing motorcycles and selling parts. Now she brings in 5,000 rupees a day (good money there) and employees two men. Asmita, vegetable farmer A Kamlari for five years before NYF rescued her, Asmita now tills her own fields with her family by her side. “Before we had to work in other people’s houses,” she said. “Now we work our own land.” After high school, NYF sponsored Asmita in an agricultural training program, and then she started her farm with a co-op loan. She’s also trained 40 other former Kamlari in farming to help ensure their independence. Make a stand for freedom — join the Freedom Loan Fund Campaign today! Watch the ABC7 New video about NYF’s work to free girls from slavery. NYF news: Victory! Kamlari Child Slavery System Ends.